Welcome to Vining Marine Ltd's web site we hope you enjoy surfing/sailing through our pages! 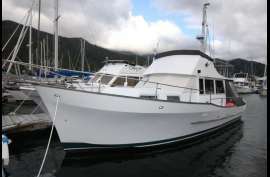 Vining Marine's (formerly Vining Shipbrokers Ltd) main office is located at the picturesque Waikawa Marina, Picton, in Queen Charlotte Sound, we enjoy on a day to day basis scenery and a lifestyle that many people come from all round the world to enjoy for brief periods of time. Many are drawn back year after year and our population is quite diverse for that reason. While we all enjoy the waterways and all that the Marlborough Sounds have to offer -20% of the coastline of New Zealand and only 1.2% of the population (including 1156 kilometres of Bays, Coves and inlets all protected from the open sea!) others are more interested in Marlborough's world famous wines and many an enjoyable afternoon is spent touring and tasting at the various wineries as well as at the Chocolate Factory! The Queen Charlotte Track also attracts large numbers of keen "Hikers and Bikers" keen to experience the walk and with stopovers like Lochmara Lodge, Furneaux Lodge, Punga Cove Resort and the Portage Resort Hotel along the way who can blame them!